"Just got the DVD of Star Wars: The Force Awakens. For the sake of backup and playback on my iPhone, I ripped it...but it failed. My ripper kept ripping the title over and over and over for the full duration of the movie. And it turned out to be 2 hours and 17 minutes of title credits in English and Spanish over and over. When I opened the output file, I could only see the scrolling Star Wars intro over and over in various languages. All the theme opening in Spanish. Any one has the same issue. How to fix it?" Star Wars are universally beloved movie series, thus undoubtedly most fans are willing to buy the DVDs and keep them as treasure. Furthermore, they will make use of DVD ripper to duplicate digital files from the precious DVDs. However, things may not go well as we imagine. We may confront various troubles like the one depicted in the first paragraph while we make DVD copy. Luckily, we can fix them. We can rip and copy Star Wars DVDs including the latest The Force Awakens DVD successfully. Part 1. How to Rip Star Wars: The Force Awakens DVD to MP4, MOV, AVI, WMV, MPEG, or Other Formats? First of all, you need a DVD ripper that can rip copy-protected DVDs. WinX DVD Ripper Platinum is available to rip both home-made and commercial DVDs to MP4, MPEG, AVI, WMV, MOV and other video formats with ease. According to testing by developers and feedback from users, it can rip DVD of Star Wars 7: The Force Awakens flawlessly when the Safe Mode is ticked. Besides, it works well with the first 6 Star Wars episodes, Star Wars 8: The Last Jedi DVD released on March 27, 2018, and also Solo: A Star Wars Story DVD released on September 25, 2018. Step 1: Insert Star Wars VII DVD into the DVD-ROM of the computer which contains the DVD ripper you installed before. 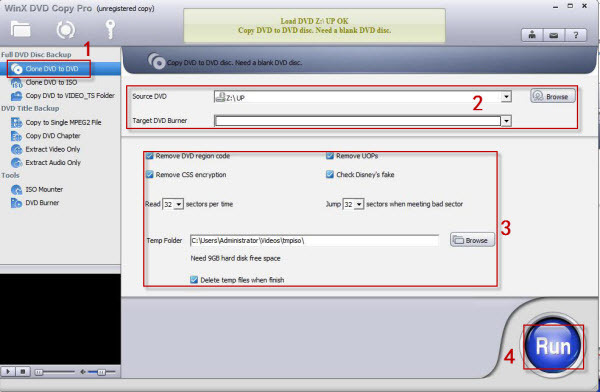 Step 2: Launch the DVD ripper, click "DVD Disc" button in the main interface, select the source DVD disc, namely the Star Wars DVD you just inserted, and then hit OK to load the DVD information. Seconds later, it will finish DVD loading, and at the same time select the correct main movie title spontaneously. Title 1 is the detected main title for The Force Awakens. Step 3: Select an output, for example MP4, from the auto pop-up Output Profile panel. From the well-organized list, you can easily catch the output you need. Step 4: (optional). Do some settings if the default can't meet your needs. For instance, specify a different audio track, choose another subtitle track, enable forced subtitle, add external subtitle to the DVD, merge multiple DVD titles, trim/crop the movie, set video audio parameters, change a location to store the Star Wars 7 in digital format, etc. Step 5: Tick "Safe Mode" to make Star Wars: The Force Awakens DVD ripping stably and flawlessly. When all settings are done, just tap "RUN" button to begin ripping The Force Awakens DVD to a digital file. Thanks to advanced technology, say, the support for multiple CPU cores use, it can finish DVD ripping at fast speed. Part 2. How to Copy Star Wars: The Force Awakens DVD to DVD? In addition to making a digital copy of DVD for backup, some people may prefer to copy Star Wars: The Force Awakens DVD to DVD disc. How to achieve this? Likewise, you still need a program for help. Not the one recommended above, but another one. Although WinX DVD Ripper Platinum allows you to copy DVD to ISO file and DVD folder, it isn't designed to copy DVD to DVD disc. WinX DVD Copy Pro is a professional DVD copy program that can copy any DVD including Star Wars: The Force Awakens DVD, Star Wars: The Last Jedi DVD, and also Solo: A Star Wars Story DVD to DVD disc, DVD folder, ISO file while preserving all menus, subtitles and languages. No quality loss. Fast speed. Windows 10 is also compatible. To get started, download and install the DVD copy software on your Windows PC. Thereafter, you can copy Star Wars: The Force Awakens DVD to another DVD following the tutorial below. Step 1: Run WinX DVD Copy Pro, and click on "Clone DVD to DVD" located at the left column. Step 2: Insert Star Wars: The Force Awakens DVD into DVD-ROM, select it as the source DVD. Input a rewritable DVD with enough storage into another drive, and specify it as the target DVD burner. Step 3: Since The Force Awakens DVD is copy-protected, you need to tick the boxes before "Remove DVD region code", "Remove UOPs", "Remove CSS encryption" and "Check Disney's fake". Additionally, choose a Temp Folder with enough storage (over 9 GB is recommended) to save the copied ISO file temporarily if you only have one drive. Step 4: Hit Run button to get Star Wars 7 DVD to DVD copy started. Thor: Ragnarok DVD has been released on March 6, 2018. Here are the tips of how to rip Thor: Ragnarok DVD to MP4, AVI, iPhone X/8, PC hard drive, macOS, etc. This is a simple guide that focuses on how to rip and copy DVD Zootopia to MP4 or other formats you want for playback flexibly with your family or kids. Part 2How to Copy Star Wars: The Force Awakens DVD to DVD?